Wednesday's Wowzers is a little late today, but I have a surprise for you: As I was blog surfing this week, I noticed a common theme: Flowers! I was seriously amazed at all of the many flower variations out there. Is there anything we can't turn into a flower?! I found 36 flower tutorials that I think you might like. Some are new, some are old, and I found a whole new bunch of creative blogs out there. So sit back and relax, and enjoy the happy feeling of spring flowers! 1. Burlap flowers by The Tidy Nest. 2. Burlap flowers and embellishments by Tatertots and Jello. 3. 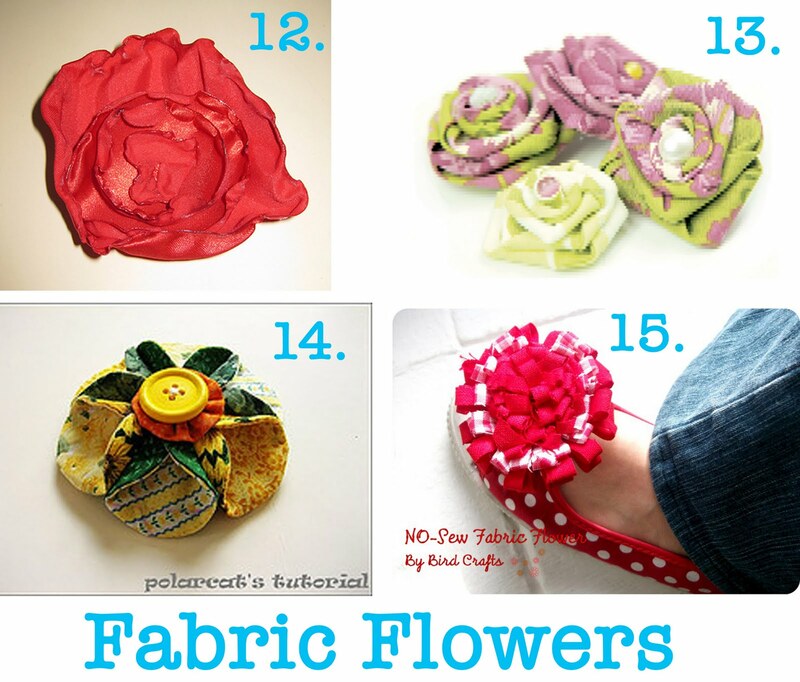 Felt flower video tutorial by The Scrap Shoppe. 4. Felt and yarn flowers by Yoonie-at-home. 5. Felt flowers by Craftaholics Anonymous. 6. Folded felt flowers by Blue Cricket Design. 7. Braided ribbon roses by Seven-thirty-three. 8. 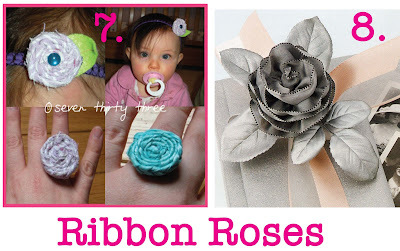 Ribbon Roses by Save On Crafts. 9. Wood flowers by A Better Life. 10. Frayed flowers by Maize in Montana. 11. Tattered flowers by Sew4Home. 12. Satin flowers by BlondieBlueEyes. 13. Rolled roses by Portabello Pixie. 14. Polarcat's fabric flower by Crafty Beats. 15. No Sew Fabric flower by Bird Crafts. 16. 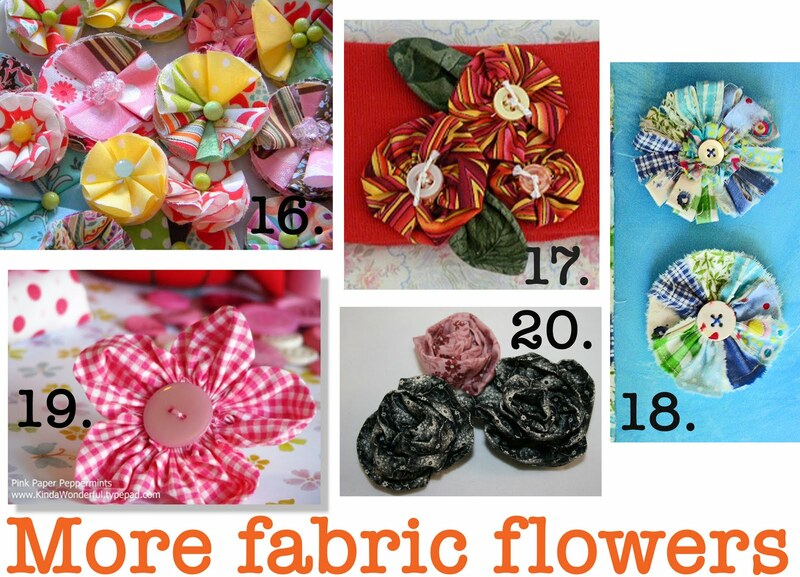 Fabric flowers by My Blonde Ambitions. 17. Button YoYo flowers by Head Huggers. 18. Fabric flower by Molly Chicken. 19. Rounded petal fabric flower by Pink Paper Peppermints. She has tons of crafty flower ideas. 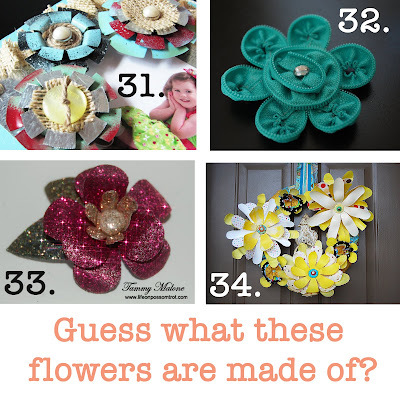 She did 31 days of crafty flowers--check it out! 20. Fabric roses by I Love 2 Create. 21. Applique flower by Anna Maria Horner. 22. Fluffy fabric flower by Artsy Crafty Babe. 23. Fabric flower pin by Grace Violet. 24. Couch flower by Heather Bailey. 25. Paper flowers by Executive Homemaker. 26. Paper flower topiary by Crafts, Life, Me, & More. 27. Paper dogwood blossoms by Sweet Something Designs. 28. Crepe paper flowers by House of Smiths. 29. Magazine flowers by Pink Paper Peppermints. 30. 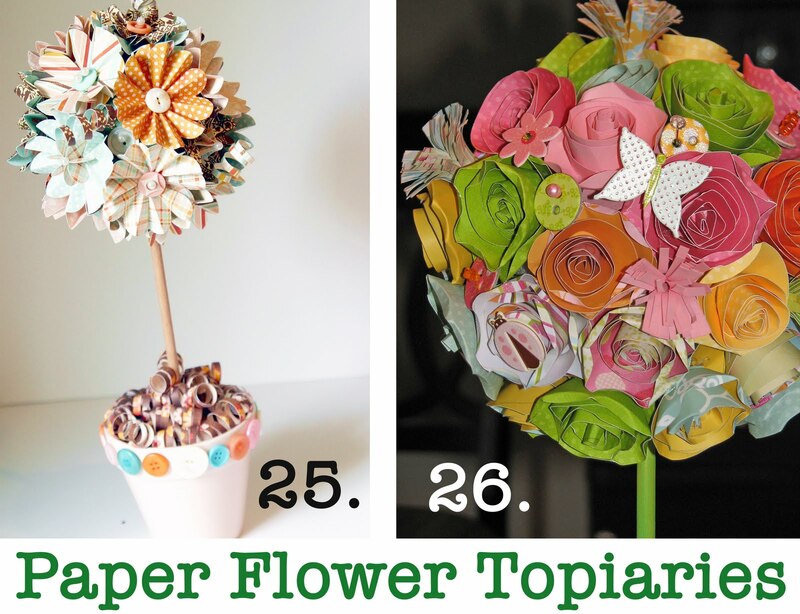 Rolled paper flowers by Talk Crafty To Me. 31. Metal flowers by Positively Splendid. 32. Zipper daisy by Craftaholics Anonymous. Is there anything Linda can't make with a zipper?! 33. 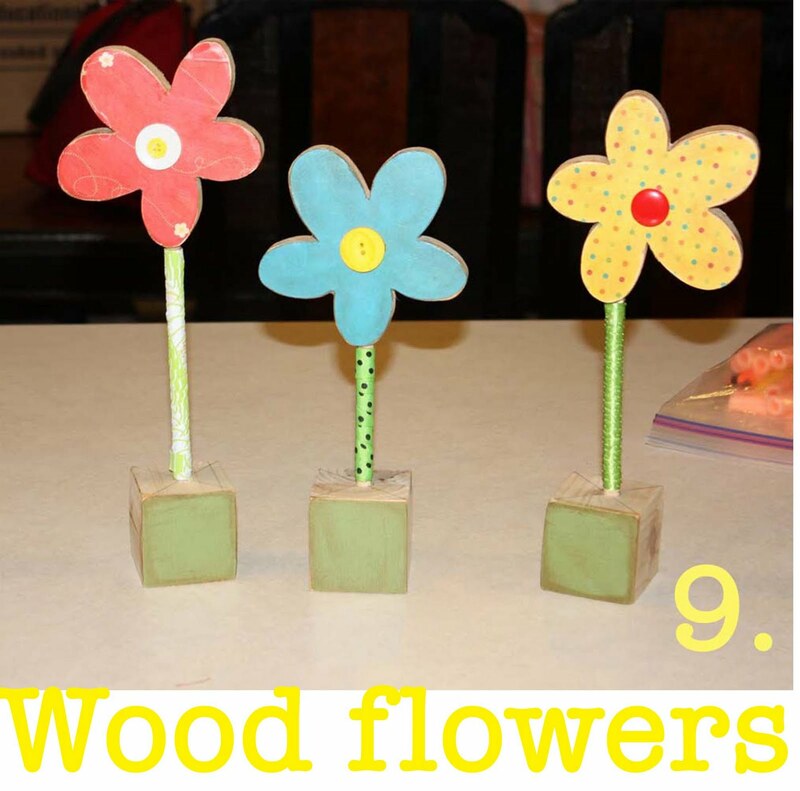 Pop can flowers by Life Is Not Just Paper and Glue. 34. Plastic bottle flowers by Tatertots and Jello. 35. Edible flowers by The Mother Huddle. 36. Edible blooms by A Spoonful of Sugar. So which one(s) are your favorites?? And if you have a favorite flower tutorial that I missed, please leave me a link in the comments or e-mail me! Now I think I should take 36 days to try making all of these! Happy spring! **Edited to add** I am becoming obsessed with finding flower tutorials! I just stumbled across a motherload here at Mel Stampz. Check it out if you want more! GREAT wrap up! I am book marking it! So nice to have all of those flower tutorials in one place! Thanks for doing all of that work – I know it take a long time to track them all down, bring the pictures over and link them all up!!! Thank so much! And thanks for featuring a couple of mine! Wow! This is an AMAZING post! All of these great flower tuts all in one place. Thanks for featuring my ribbon flower! Thank you so, so much, Alison, for compiling this list – and for featuring my metal flowers! I really appreciate it. 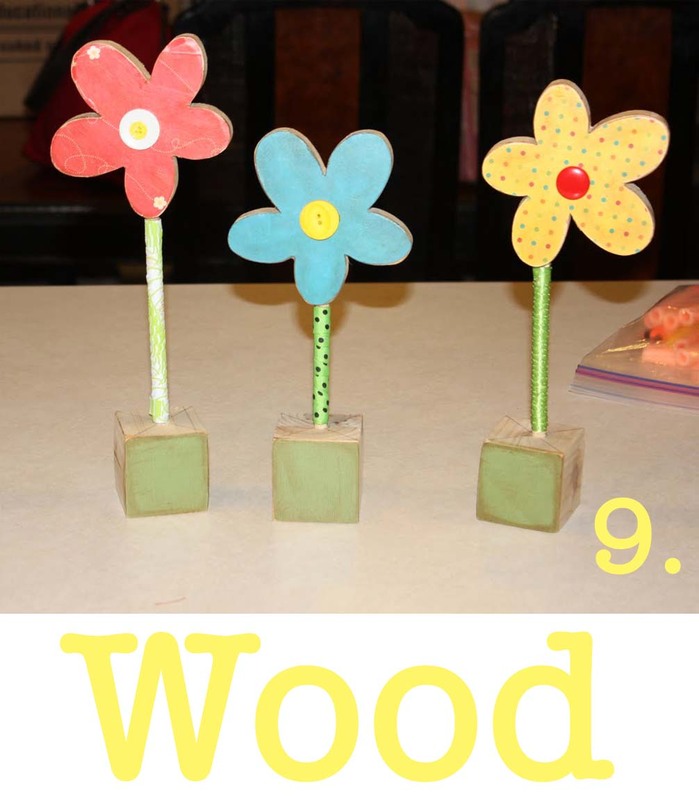 🙂 There are so many fabulous flower projects here…I don't even know where to begin in looking through them! Oh, this post is so getting bookmarked!! I'm infatuated with all things flowers right now. 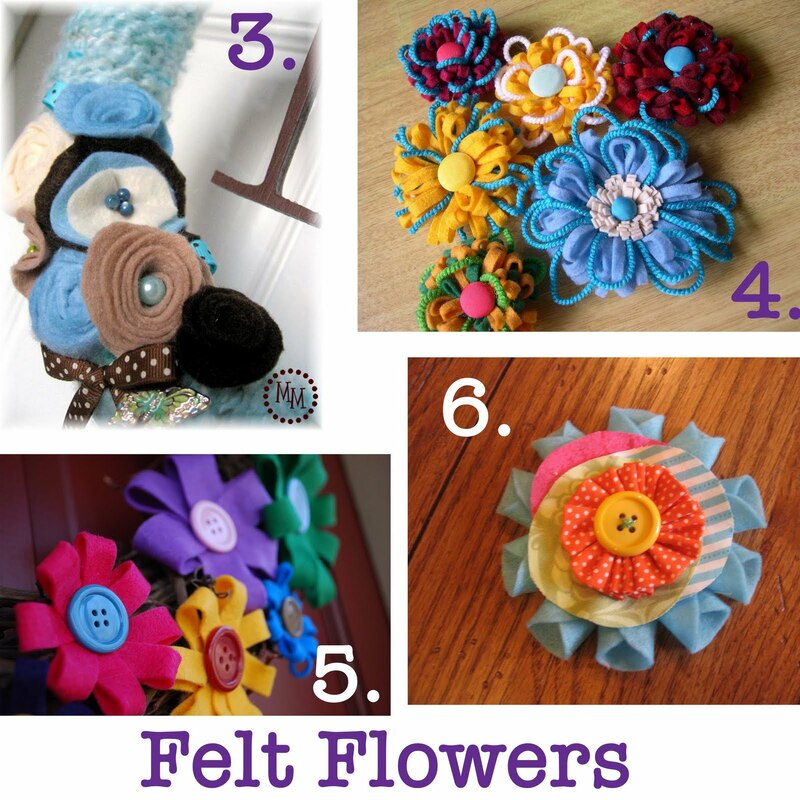 Thanks for including my felt ones! Awesome list! I have been wanting to know how to do a few of these, so thank you! Thanks for the double shout out!! Great job compiling this list! Thanks for all your hard work! I appreciate you featuring my flowers! Ohhhh, thank you thank you thank you! This will be a fabulous reference for me! So many flowers, so little time! I love the burlap flowers- so unique! I am just stopping by from NFF – what a super cute blog you have and I love, love, love your blog name – so fun!! Thanks so much for featuring my rose 🙂 What a beautiful collection and wide variety of styles. Loved looking through all of them. OH MAN!!!! This is awesome!! All of these in one place. I LOVE!!! I have been so looking for a collective like this. Thanks so much for putting this together. I am going to bookmark your post as a reference. Thank you so much for gathering these all up for us! 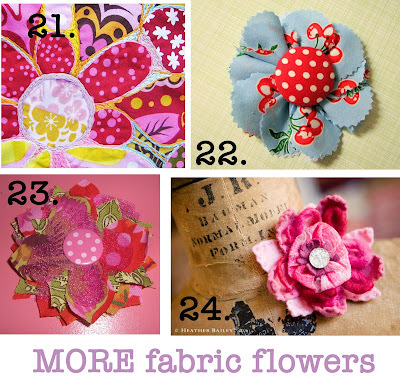 I love them all and this has inspired me to make more, fun flowers! Good job! Okay, uhhhh, you are amazing. Also, I think I love you. This is so great that you've put so many of the tutorials together, I've searched many of these out before and I love that you have them all in one place. And thanks so much for including me and linking to me! Thanks for the link! Love all the flowers you have found. Such variety! LOVE this post! Thanks for taking the time to do it! And THANKS for the feature! Thank you for this post! 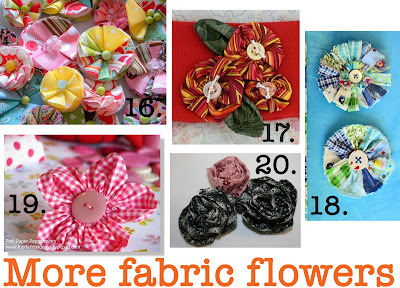 I've had a hankering to make some fabric flowers for a while now, and this will DEFINITELY help my motivation! This ROCKS!!! I can't tell you how excited I am to have this all in one spot! I filed this at thecraftersfilebox.com. Thanks so much for the "round up!" 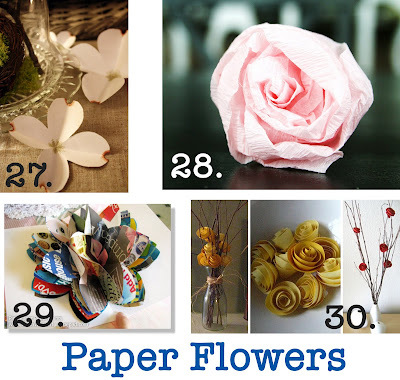 I should have told you this earlier, Alison, but I put together a list of some of my favorite paper flower tutorials last fall. Mel is on the list, of course! She has a list I could peruse all day! Your Post inspired me to have a special Flower Week at my blog. It startst the 24th. I hope you'll stop by to check it out! wow talk about a kid in a candy store…or I mean a flower garden! I just stumbled across your blog and it's awesome! You definitly have a new follower here. Thanks for doing this post, all the time you must have spent just to share something great with us. You Rock! This post is great! One of my readers just sent me here because I too am compiling a list of these fun tutorials. I am going to link up your post and send my readers your way!!! Thanks again!